Kindle is an ebook reader from Amazon, now an ebook reader is essentially a tablet just like the iPad, but it’s built for one thing and on thing only. Reading books, no angry birds here, just plain ol’ reading fun. And eventually I found a few sellers of Kindles online, where else but at everyones favorite tech forum, lowyat.net. So far there are about 3 sellers online, these include a forum users Giondori, qisahn and sambb67 (click on the user names to access the threads they’re selling at). I got mine from user sambb67, if for no other reason then a quick scan of previous customers included a ‘elite’ member. That’s a bit of crowdsourcing for you, one of the best ways to detect fake reviews and fake scams is to check on the reviews, if reviews are given by people who’ve just joined within the past years and usually very very positive, it’s a fake. I’m not saying the other sellers are fake, I’m quite sure all of them are genuine sellers, but sambb67 was the only one with a elite member review. Elite members are lowyat members who’ve reached a certain amount of post and have been around a block a few times. So they’re generally more trustable then newbie members with less than 1 year of membership. So after spending Rm415 for a Kindle Touch, I finally got my hands on a book readers dream. You can also purchase the kindle from the kindlemalaysia.com website, this isn’t an official channel, but these guys look legitimate and will even help you with warranty claims. They do charge slightly higher than the guys at lowyat, but these guys have an actual web store, so you’re paying for that as well. Plus they look to have good service. Lastly I bought the Kindle Touch with Ads, and it cost about Rm150 cheaper than the no-ads version. There is no reason to splurge that extra bit because the Ads aren’t intrusive. So unless you have a problem with money, my advice is buying the ads version and use the extra money to buy books!! I repeat–THE AD VERSION IS OK! The first thing you notice about the Kindle is that it’s small. It’s slightly bigger than a regular paperback book, but smaller than a magazine. The 2nd thing you notice is that the instructions on the screen isn’t printed on paper, it’s on e-ink. The e-ink display is absolutely awesome, it’s the closest thing to paper I’ve ever seen, it’s easy on the eyes and Amazon wasn’t kidding when they said you can read it in the Sun–because you definitely can. The e-ink display looks and feels just like regular paper and I can guarantee you, you won’t think you’re reading a electronic display at all. The e-ink display also promises great battery life with Amazon claiming you can go for months without re-charging. The one drawback about the display though is that the refresh rate isn’t that great, and while you’re switching between pages, the experience isn’t all that smooth. If you’re used to the smoothness of an iPad or the Galaxy Tabs, this will really start to annoy you. The e-ink display takes some time to switch and doesn’t have that smooth scrolling, after a while you develop a patience for it, but it takes a while. No scrolling here, but then again an iPad isn’t going to last 2 months without a re-charge and wouldn’t be as easy on the eyes, pros and cons I guess. Lastly when you carry the Kindle around you notice this thing is super-light. It’s lighter than carrying around a paperback book, Amazon really went through a lot of trouble trying to make this a seamless transition from reading physical books to reading the Kindle. Overall the device feels great and for just Rm400+ bucks it’s a steal. It has to be said though that the device can be bought in the US for USD99, which is about Rm300 here. You’re paying a 33% premium for the shipping to Malaysia, it’s quite a hefty premium, but these guys at Lowyat have ready stock and they’ve already absorbed the risk for you. So I think it’s a pretty good deal. Plus, a lot of people theorize that Amazon actual sells Kindles at a loss, hoping to recoup the money from the book purchases you make online, so I think Rm400 is the actual cost of the device, which makes me a feel a tad better about the purchase! Now, technically the Kindle isn’t available in Malaysia, and Amazon won’t even ship it to you. So if you try to activate your Kindle with a Malaysian account chances are it won’t work, or you will work but you’re not going to get the ‘free’ US content. What you really need is a US-based Amazon account. To get a US-Based Amazon account, all you need is two things a US IP address, so Amazon thinks you’re logging in from the US and a US Home Address. Then it’s just a simple matter of registering a new account. Either use proXPN or I used my Amazon EC2 instance. As long as your Amazon EC2 instance is located in the US you can pass off as US user. If you work for Multi National, chances are you also have a US VPN service, this will also suffice. The simplest way though is to use a proxy like texasproxy.com or hotspotshield.com, I’ve also wrote a post before on how you can create your own proxy if you have webhost. Once you have a US IP address, it’s an simpler matter to get a fake US address. Head on over to Google Earth, look for something generic like Bank of America, Citibank or Dunkin Donuts, select one of them and use the Address.A simpler method may be to use http://www.realusaaddress.com/ as well. I’m no advocating fraudulent activity here, as you’re obviously trying to pass off for someone you’re not, but this is the only way to get a US-Based Amazon account. With a US IP address and US address, just register yourself on Amazon and sync you Kindle and you’re good to go. You only need to do this once, and that’s it. From then on you don’t need to use the proxy anymore. So it’s not that inconvenient. Now Amazon won’t let you buy books for your Kindle with your Malaysian credit card. If you have US credit card, then you’re good to go. However, if you’re like me and don’t have a US credit card there are other options, and the one I chose was using the gift card. A gift works around the US credit card requirement by having your Malaysian Credit card purchase the gift card on your Malaysian account as a ‘gift’ for your US based account. This way it looks like an American is purchasing the book with the gift card. 1) A Malaysian based account I use for my Amazon Web Services and the few things I buy from Amazon. So I head on over to Amazon , browse to Kindle Gift cards, and then select Instant Delivery Via Email this sends the giftcard directly to my email. In the receipient email field I place the email address of my US based account, and then use my Malaysian credit card to purchase the gift card. If everything goes as plan you’ll receive the giftcard in your US based accounts email. For some reason my confirmation code ended up in the spam folder, presumably because it had “Gift” in the title, so if you don’t get the email instantly, try looking in your spam folder. Now we’re almost there. I’ve blanked out the claim code (because I really did buy $10.00 of Amazon credit). Then I logon to www.amazon.com/kindlegift as my US based account, and apply the claim code. Once that’s done I can easily see a redeemed amount of USD10.00 in my account, and I’m ready to purchase. This $10.00 will be immediately deducted from a purchase. It’s also obvious, (but I’ll point it out anyway), you’ll need to have the exact amount of your purchase (or more) to make the transaction successful. While US users with US credit cards can complete the sale easily, Malaysian users can’t ‘top-up’ with your credit. So if you’re planning or splurging I suggest getting your shopping list first before you buy your gift card. So in this case you no longer have to use Method 1, but you can just quickly setup an American Kindle Account, and then register your Maybank credit card with it–and voila you’ll be purchasing ebooks from within your Kindle–a far better and easier way of purchasing. You know how I feel about copyright, I don’t quite like it. The analogy is quite straightforward, I can buy a book from Amazon and have them deliver it to me and pay no taxes. I know, because I’ve ACTUALLY bought books from Amazon and bookdepository and betterworldbooks and have never been charged a cent in taxes for these books. So why can’t I buy an e-book from Amazon? However, hand carry isn’t the same as a cross-border purchase. So the law is quite clear that if I buy ‘physical’ books from Amazon, I’d have to pay a 20% import tax. That’s a pretty steep price, but it’ll be cheaper than buying it locally from a brick and mortar store. In my mind, something is wrong with the Government when tax exemptions are given for books (up to Rm1000 a year) and broadband (up to RM500 a year) and then they have a sales tax books and ebooks. What’s the point of the tax exemptions any way, as far as I understand it only 20% of the workforce actually pay income tax, the better way to encourage people to read would be to do away with the import and sales tax altogether. So in conclusion, I don’t know if it’s strictly legal from a tax perspective, but at least you’re buying an original book where the author (and publisher) is getting some money from your purchase. However, since you’re not paying taxes, it’s technically illegal. You might as well go all the way and download the ebooks from torrent files, just kidding. Maxis has an ebuuk page online, but I’m unsure if they provide .mobi or .epub files to go with it. I’m not advocating copyright infringement but the local book publishers are charging us nearly 3x more the price of Amazon ebooks, for the exact same content. I intend to write up about the legality of downloading ebooks from Amazon in a separate post, but for the time being, it’s suffice to say that besides the little ‘fraudulent’ behavior of registering a fake US home address, and the fact that you’re not paying the 20% sales tax, there is nothing wrong from a copyright perspective of downloading books from Amazon. Book publishers may complain, but that’s the law. The reason Amazon won’t sell you the book is that they have a contract with Book Publishers to only sell the content in the US, however the stipulations of that contract do not apply to Amazon customers (i.e. YOU!!). 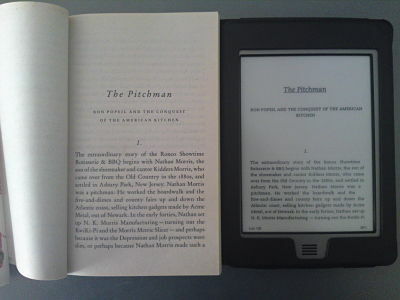 I’ll upload this in a separate post, but the picture above was a snapshot I took of a side-by-side comparison of the Kindle displaying the first chapter of Malcolm Gladwells “What the Dog Saw”, with the actual book. I chose this book because it’s the only book I had which was the same size as the Kindle. Other books were about 20-50% bigger, so in fact the Kindle is smaller than most non-fiction books. I don’t want to get into too much detail about the legality of downloading books from Amazon, but I will say this– the copyright holders still get a fee from book sales whether it’s in America or Malaysia, and there’s no reason why Malaysian ebooks cost so much. Other than that, the Kindle Touch is so awesome, I’ve decided to buy another one, Or maybe the Barnes and Noble Nook Glow, which has been getting a lot of reviews. If you’re thinking of getting a Kindle Touch, let me save you the trouble–JUST GO AND GET ONE!! All the sellers above appear trustworthy, although I can only vouch for the guy I actually bought it from which is sambb67. That’s all folks, now happy reading!! awesome! I was scouring the Net for some form of explanation on using the kindle in Malaysia. Im an avid reader too and am very disappointed that we dont support it. Best thing for me to do now is to get my brother in law to buy it there and register it to his address i suppose. Thanks for posting! Hi. Thanks for your indepth review! I am also thinking of getting a Kindle [Kindle Touch Wifi] in KL. However, my main use case for an Ebook reader would be to read website articles and pdfs. In particular, I plan to use services like Read It Later or SendToReader, which send these webpages to the Kindle through email -> they send it to the @kindle or @free.kindle email address. Hence, I want to ask you if it is possible to use such services and receive emails to my Kindle Touch in Malaysia, through a Wifi connection [or USB connection]. I would really appreciate your kind help in this matter. I am also an avid reader and would really like a way to read online articles on a Kindle. Thanks! I’m not entirely sure if Read it Later works well on the kindle, but i can easily read my mails on gmail with no issues. PDFs don’t really display well on the Kindle, at least not as nicely as the native kindle formats, so for website reading and PDF reading, I’d recommend a more functional color screen tablet rather than a Kindle Touch. @kindle or @free.kindle email address through your Kindle, when connected to Wifi, in Malaysia. I wanted to know whether there would be any issues [such as IP problems that would require VPN, or authentication issues, etc], or if you could easily receive and open the emails on your Kindle.Kindly let me know. Thanks! HI Raghav, I’ve just run a small test, and indeed you can receive your kindle.com emails on your device. However, you need to ensure the email sending to the address is on your approved email list :)Hope that helps, please like the page on facebook if you like the post. Thanks. 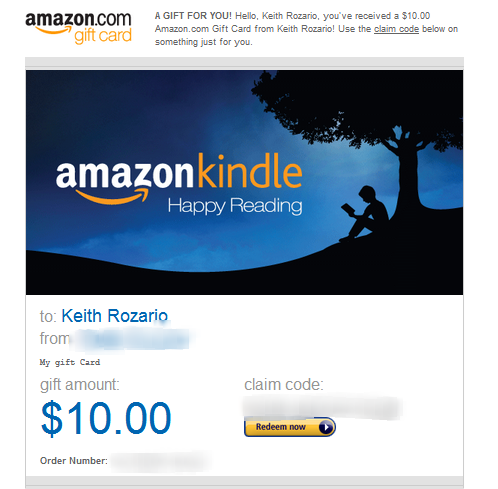 Thanks again, Keith! I’ll be buying a Kindle soon in KL. Cheers! What will you recommend for young researchers that mostly deal with Journal and conference articles in pdf format. OK brother, Thank you very much you did a good job. May Almighty reward you abundantly. I found this extremely helpful! IT dinosaurs like me would probably need a bit of hand holding and Keith has been very helpful to take me through step by step. Hi Keith, Just read your review. I bought a Kobo e-reader from Australia, last December. After using it for about 3 months, the screen broke up in lines. I wrote to Kobo Australia and was given a replacement unit (which they parceled to an Australian address I gave them) with no extra cost to me. My uncle whose address I used, sent the device to me in June, 2012. This morning when I switched on the Kobo, it happened again! – the screen had black streaks running across it!! If you read the reviews on Kobo you’ll know that this happens to a lot of people. I was lucky in the sense that it was still within the warranty period. Anyway, I’m thinking of switching to a Kindle instead. Read some of the blogs and I understand Kindle has the same problem. Just wanted to know how long you’ve had the Kindle and have you come across this problem. I do not want to go through that again with Kindle. Thank you. I bought the Kindle in April, and it’s been nothing but Amazing these past 4 months. My wife reads it off and on, we took it on our recent trip to Australia and it lasted the whole two weeks without a recharge for about 1-2 hours of reading per day. Overall it’s a solid device you can’t go wrong. After a disappointing experience with Amazon Kindle products, I’ve been using for the past year a Kobo Touch and I imported from US few more as presents for my friends and family, and so far none experienced problems whatsoever. I’ve never had a hardware problem with my KT and I’ve had it for close to a year now. It’s only some random software problems that required me to restart the Kindle every now and then. yeah, the kindle touch is a pretty reliable piece of hardware. it’s less complex than the iPad or other tablets which makes it less likely to break down as well. You might want to consider them – good service, prompt response! Thanks Shingawa, but just out of curiosity are you ‘not’ looking forward or are you ‘now’ looking forward to the Kindle Paperwhite? Hello, great article! Just a question. Is it safe to use the deliver content to Kindle feature? My PC is on VPN but my Kindle is not, so there’s a concern.. Yes it’s more than safe. The deliver content to your Kindle is over your Wi-Fi (or 3G) network. Once you’re kindle is connected to the internet you can sync your subscriptions ‘on air’. The deliver content to Kindle doesn’t go through your PC, it’s direct from your Kindle to Amazon. Hi, thanks for sharing your expertise and experience here. I am in UK and planning to give a new Kindle to my niece in Malaysia. If I set up an account and purchase ebook here in UK, would she be able to download it in Malaysia via wifi? Or even if I were to give her my Amazon login ID and password, would that be possible (assuming that there is no IP address issue)? Thanks. To be absolutely sure, what I suggest is to buy the Kindle and activate it the UK before sending it over to Malaysia. Then she’d be able to download it via Wi-Fi directly from the Kindle. Thanks for the immediate reply and tips on activation. I followed yr steps but could not set up set up the amazon ac when logged in through texasproxy servers. Have u verified that it can work with texasproxy? When I tried it some time back (about 6+ months ago) it was working. Not sure if it works now. Pingback: Would downloading Irshad Manji’s ebook be Illegal? Hi i am currently in norway and have bought a kindle and will register it here first. The kindle is actually purchased from heathrow in london. Can i then purchase ebooks directly from amazon via wifi using kindle straight or do i still have to use your way of gift card? I meant when i return to malaydia next week can i then purchase ebooks directly from amazon via wifi using kindle straight or do i still have to use your way of gift card? I’m not sure about the uk kindles, bur the American ones dont need gift cards.I can easily purchase ebooks with my amex credit card… provided I use my ameeican account. Hi Keith, thanks for the informative article. You said that you are using Amazon EC2. Can you please elaborate on that? Which part of the EC2 service are you using to access the Amazon Kindle store? Right now, I am based in Malaysia and can purchase Kindle books because the last time I used the purchasing service, I was in the US. I don’t know how long it’ll take Amazon to detect my Malaysian IP this time, but I want to use a US IP before it detects and blocks me from purchasing Kindle books. Actually u can still buy books even without a US IP address. I tried to buy a book on my ipad that is only available in the USA and the transaction completed perfectly. U should buy amazon gift cards as they work worldwide. It’s better than going through the tedious processes of getting and using a US credit card.. However, I noticed that my Maybank Amex works perfectly well without the need for a gift card. So actually I recommend people use an American Express for ease of use. i love my kindle so much and i’m sick of amazon not allowing me to buy their books online. i’m so lazy to go through so much hassle that i rather buy from smashwords, kobo, nook or etc and then do the file converting myself. That’s a good idea. Do you have to do anything to buy books from kobo or nook?? Or does your Malaysian credit card work as well? yes, malaysia credit card works. smashword is the easiest, you just pay, download and transfer the file into the kindle. kobo is getting more advance with their privacy issue, so i have to make use of calibre software to strip the DRM to allow me to convert the epub to mobi. but is still way easier compare to navigating my way through amazon. Great article, in regard to the acquiring and using a Kindle. I’ve been able to purchase kindle books with both the Maybank Visa (RM10K limit) and MasterCard (RM5K limit) with MSOS (Maybank Secure Online Shopping) activated that can be done by calling the number at the back of your card. The charge is reflect in dollars, but usually a double charge. Using Kindle on other devices is also easier, but obvious the hampering point is the battery. Could a nice addition for people who don’t want to go through the hassle of buying a new device. thanks for the update. Yes, I’ve been meaning to update this document, but never really found the time. Thanks for the reminder, I’ll do it now. Thank you very much. That was helpful and easy to follow. Hey guys, you can remove the ads with this. You have to register your own account or your credit card will be open to whoever the account is registered to. Sorry took a while–3G should work regardless, but you need to have a sim card installed. Thank you for your info and by the way, do you know Kindle Malaysia? Are they trusted seller? Because I am planning to buy it from them but still confuse whether I can trust them or not. If you know something, please let me know. I just bought a Kindle Paperwhite 2 from Kindle Malaysia in June. They provide superb service and support. Delivery was next day by PosLaju. Note: I am not affiliated to Kindle Malaysia in any way. Just want to share my experience with them. Awesome! Thanks for the comment Chan. Hope Yuni found it helpful as well. Hi, I despatately need help. A Malaysian who has a Kindle for two years by now. The thing is, my credit card expired and I have updated the info without changing my fake US Address. Now, somehow Amazon detected that Im not in US so they are not allowing me to buy anymore. I need help to get an expert to fix this issue. Im more than willing to pay any fees for this. Try using a proxy / VPN / Hola Unblocker to access amazon and update your credit card information. Might work. Not really I think — there have to be easier ways to do this now.